In the previous post about mixed cost, we stated that a mixed cost is just the sum of the variable and fixed components. 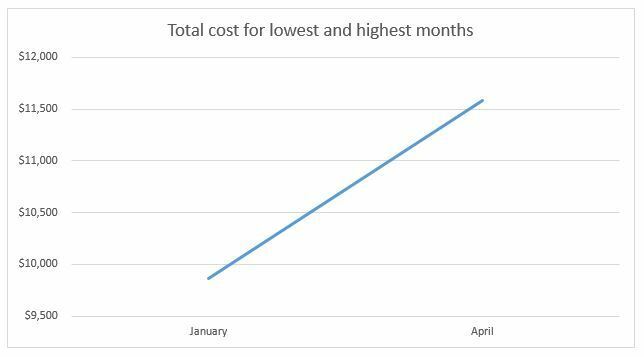 This is fairly easy to deal with when we are dealing with an external cost where we are given the variable rate and the fixed cost. In business, many mixed costs are actually generated internally. Therefore, the variable and fixed components are not clear. We must find a way to calculate the fixed and variable components. There are a number of ways to calculate the cost formula for a mixed cost. In this post, we will focus on the high-low method. This method is not the most precise method but it is the easiest to calculate. It does not require spreadsheet or graphing software. Below is some data from an oil change service business. The business has fixed and variable costs but wants an easy way to do cost planning for future budgets. The company would like you to write a mixed cost formula for planning purposes. It might seem daunting at first but it’s really a lot easier than you might think. Since this is called the high-low method, we first need to determine the highest point and the lowest point in the range. Because the variable rate and fixed costs are not always 100% constant, the cost should not be used. Since the number of oil changes is a consistent, reliable measure, we should use that to determine the high and low points. Looking at the data in the chart above, what would you choose as the high and low points? April is the high point with 2,950 oil changes and January is the low point with 2,200 oil changes. Once you have picked the high point and the low point, you can throw out the rest of the data. You no longer need it. You might be wondering how we are going to jump to solving for the variable rate when it doesn’t seem like we have a whole lot of information. We have more information than you might think. Let’s look at these two points on a graph. If you read the post on variable cost or the post on mixed cost, you might remember that we talked about slope. I know that slope is terribly boring and something that you might be trying to forget from your math classes, but is actually important here and makes this concept much easier to understand. We said in the earlier posts that variable rate is the slope of the line. That means that for every additional oil change performed, the total cost increases by the variable rate. In January (the low point), the company performed 2,200 oil changes with a total cost of $9,860. In April, the company performed 750 more oil changes. Those additional oil changes cost the company an additional $1,725. Over the course of 750 oil changes, cost increased $1,725. That also means that the variable cost of 750 oil changes is $1,725. Since we know that the variable cost of 750 oil changes is $1,725, we can divide to calculate the variable rate. The variable rate is $2.30. Let’s go through the calculation step by step so you can see where I got all the numbers. First calculate the change in cost and the change in activity. Next we will divide the change in cost by the change in activity to calculate the variable rate. If you’ve looked at that formula before and thought “huh?! ?”, I agree. Many times in managerial accounting, understanding what is actually happening is much more helpful in solving the problem than trying to memorize the formulas. Just remember that the increase in cost is all variable cost. If you calculate how much the activity changed, you now have the total variable cost for the additional activity. That is enough information to calculate the rate. We need to fill in all the additional information so that we can solve for the fixed cost. We clearly have the rate. We solved for that above. Where could we get figures for total cost and the activity level for that cost? Wouldn’t it be nice if we had some data for total monthly cost and the activity associated with it? Well, it’s a good thing we have the high and low points. The data gives us exactly what we need. 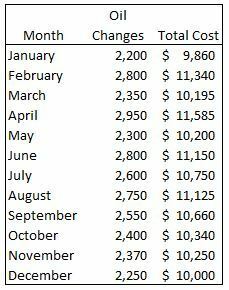 We have the total monthly cost for two of the months and the activity associated with those months. Brilliant! Note: You must use the figures from either the high point or the low point since the variable rate was calculated based on those numbers. The high and low points will give you the same fixed cost (within a few cents if you had to round the variable rate). Plug either the high point or low point into the cost formula and solve for fixed cost.